Looking for a Penrith concreter? You just found the best. Paul Galea is a Penrith concreter with extensive experience in a wide range of concreting works both in the Residential, and the Commercial and Industrial fields. He has been concreting for over two decades throughout Penrith, Blaxland, Lower Blue Mountains, Windsor, and all throughout the Western suburbs of Sydney. Paul is the owner and manager of Concreting Services NSW (CSNSW), which is based in the Penrith area. CSNSW specialises in residential concreting services including Driveways, House slabs, Shed slabs, Patios, Footpaths and just about any type of concreting project. CSNSW can also provide associated concreting services such as concrete removal and soil excavation. For residential concreting services or any other type of concreting services, there is only one Penrith concreter to call, so call Paul today. House Slabs are one of the most critical parts of constructing any house as it is the foundation of the building. Starting right ensures that the rest of the work that follows is on track. Concreting Services NSW offer a complete package starting with excavations, piers, formwork, fixing reinforcement, placing and finishing concrete. We have worked on a wide range of house slabs including Raft slabs, Waffle Pod Slabs, Infill slabs, Slab on ground foundations and more, all throughout Penrith, Blue Mountains, Blacktown and Western Sydney. Driveways are the first thing you see of a property from the street and a good, well planned driveway will add value to your home. Concreting Services NSW specialise in driveways and have done numerous concrete driveway projects throughout Penrith, Blue Mountains, Blacktown and Western Sydney. We can either build you a new driveway from scratch or remove your old driveway and replace it with a new driveway. Popular types of driveways we have built include stencil crete, colour in the mix and standard plain concrete, we do it all. Offering a complete package starting with excavations or the removal of your old driveway, formwork, fixing reinforcement, placing and finishing concrete. Patios or Alfresco’s are the place where family and friends get together. Concreting Services NSW can design and construct that special space to meet your needs. We are able to provide concrete suitable for floor tiles or why not save some money and ask us about our decorative concrete finishes. We offer complete packages starting with excavations or the removal of your old concrete, formwork, fixing reinforcement, placing and finishing concrete. Concreting Services NSW offer a range of Shed slabs, Raft slabs, Waffle Pod slabs, Infill slabs, Slabs on ground, We offer a complete package starting with excavations, piers, formwork, fixing reinforcement, placing and finishing concrete. Whether your tired of walking through the mud to get to your cloths line, mail box, taking the bin out or looking at that area between the house and fence where the grass wont grow, we can help you. Concreting Services NSW offer complete packages starting with excavations, formwork, fixing reinforcement, placing and finishing concrete in plain concrete or coloured concrete. 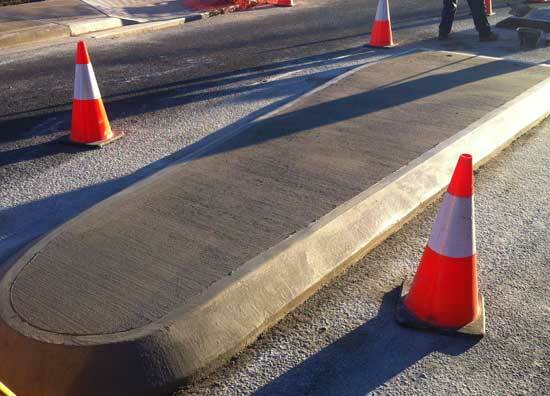 Concreting Services NSW has done a wide range of kerb and gutter related concreting projects throughout Penrith, Blue Mountains, Blacktown and Western Sydney. Whether its on the street, for garden edging, driveway edge, and any other kerbs, gutters and edges, we can help you. Excavations are necessary in any concrete project where you will need footings, pier holes, pits, regrading your land for a new drive way or house slab, and excavation of old concrete. No need to find a separate contractor as Concreting Services NSW can look after your excavation needs for your new concrete project. Concreting Services NSW will remove your old concrete driveway, house slab, foot paths, patios or any concrete to make way for your new concrete pavement. We dispose of your old concrete in an environmentally friendly manner, never sending the old concrete off to become land fill; rather having your old concrete recycled to become other building products. During the course of concrete projects there is often a need at some stage for soil to be removed. With Concreting Services NSW on the job theres no need to find a separate contractor as we have the trucks and equipment needed to remove any excess soil. Whether its house footings, footings for house extensions and granny flats, fence footings, shed footings, Concreting Services NSW can do them all! We offer complete packages starting with excavations, fixing reinforcement, placing and finishing concrete. Piers are the foundation of any building. Concreting Services NSW can do complete packages starting with excavations, fixing reinforcement, placing and finishing concrete. Concreting Services NSW has undertaken various culvert concreting projects, both small and large, for councils and builders throughout Penrith, Blue Mountains, Blacktown and Western Sydney. Detention Tanks (OSD) and Stormwater Pits are often a DA requirement when building. Concreting Services NSW offer complete packages starting with excavations, formwork, fixing reinforcement, placing and finishing concrete.